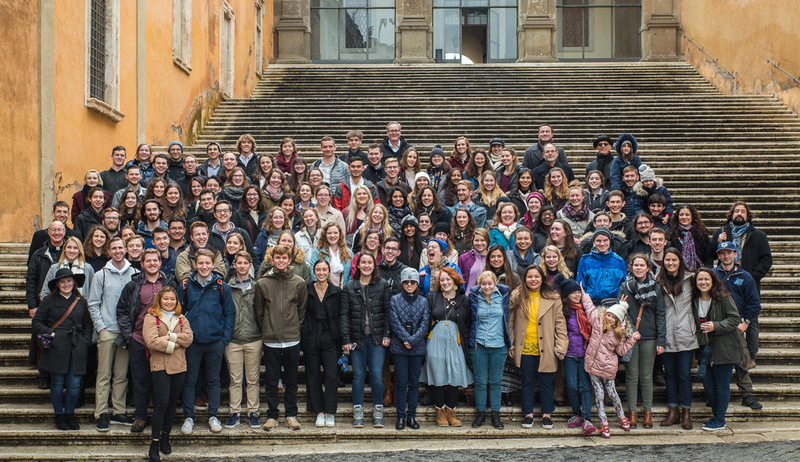 In addition to enriching excursions in Rome, our Undergraduate Summer Program’s journeys have led them to many memorable and historical places and experiences. The archeological site and ruins of Ostia Antica were among the first visited. After a morning of classes, upon arrival the group found a cool spot in the shade to enjoy their sack lunches provided by the generous Mensa staff. While students ate, Dr. Rombs gave a site lecture on the history and importance of the ancient city of Ostia, incorporating quotes from St. Augustine. The charming town of Assisi was the next stop, and after a four hour bus ride, the group stepped off the bus and inhaled the fresh air of Assisi’s higher elevation. Students and faculty alike were quick to fall in love with the sights of the hill top town. After becoming orientated to the city, students put some miles on their shoes as they explored the home of St. Francis and St. Clare. 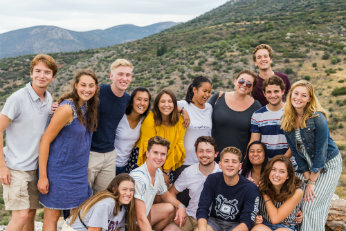 Many students chose to make the small hike up to Rocca Maggiore where they could explore the old fortress and enjoy an amazing view of the city and nearby farm lands. Another popular site was the church of San Damiano. The famous San Damiano cross had just been moved down to its original home in the Chapel, giving students a wonderful and unique opportunity to experience a piece of Catholic history. After all the walking the group re-fueled with some homemade pasta! Yum! The following day in Assisi began with mass at the Basilica of St. Francis, followed by a tour of the Basilica by Friar Martin, a New York native who made the frescos come alive. Throughout the tour Fr. Martin reminded students to thank their parents for this experience and to make good decisions. In the afternoon, brave members of the group hiked up to the hermitage of St. Francis. Following fairly steep paths, students were excited to see their activity trackers read that they had climbed 180+ flights of stairs! They found much needed rest and peace at the mountain top hermitage. A final visit in Assisi was to the Basilica of Santa Maria degli Angeli before continuing on to Florence. 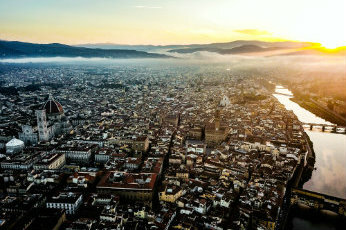 Florence’s urban scene brought a new kind of excitement to the students, and they enjoyed generous amounts of free time there. They often returned to the hotel with victory stories of bargaining with leather merchants and the new bag or pair of shoes to prove it. After having pasta and pizza day after day students also enjoyed kebabs and burgers along the way. The vast array of outstanding art is omnipresent in Florence. The professors continually shared their insights on tours through the amazing collections at the Uffizi museum and San Marco museum. Prof. Marchetti’s references to Dante focused on the poet’s literary importance as well as his love for the city of Florence, which UD students could relate back to Lit Trad II. After long days of shopping and touring museums, students still had plenty of energy to seek out Florence’s night life at the Ponte Vecchio and Irish themed pubs. The next excursion took students to two famous monasteries as well as the birthplace of St. Thomas Aquinas. Students enjoyed the added company of Fr. John and Fr. Brown on this trip. The first stop was Fossanova, where the group celebrated mass together, and were then led by Fr. John on a tour of the monastery, sharing the history of his Cistercian order. Thanks to Dr. Rombs’ familiarity with the locals, students were able to buy some sweets for the road even after the shop had closed. The next stop was Rocca Secca, where nearly all the students braved the heat and climbed to the castle and birth place of St. Thomas Aquinas. The journey ended at Monte Cassino, where the students explored the monastery, and were amazed by the beauty of the architecture, altars, and the most stunningly panoramic views of the day. Students enjoyed their Sunday afternoon following the path of history on the Appia Antica. The group walked 6 kilometers along the same ancient road as St. Peter and St. Paul as well as countless other pilgrims. Dr. Rombs and Professor Marchetti shared inspiring site lectures on the journeys of the two saints as well as the significance of Christian martyrdom. They then ventured underground for a tour of the catacombs of San Callisto, and afterwards, attended mass celebrated by Fr. Brown. In his Homily, Fr. Brown spoke about the need to give a confident “Yes” to following God as did the Martyrs and many of the souls that were laid to rest in those very catacombs. Students climbed the stairs back into the Roman summer heat with the flame of their faith burning just a bit brighter. The students were greeted in Subiaco by Dom Maurizio Osb, who led the tours of both the Monesterro Sacro Speco and Santa Scholastica. The first of the two tours was of the Monastery of St. Benedict. The monastery had a unique beauty with its combination of smoothed, frescoed walls and areas of the natural rough mountain rock. The monastery, built into the side of a mountain, also offered some breathtaking views. After purchasing some souvenirs, the group headed back down the mountain to Santa Scholastica. Here they enjoyed a delicious meal and a wonderful gelato cake dessert. Dr. Rombs entertained the group with a post lunch reading of Cardinal Ratzinger’s address on Europe’s Crisis of Culture. This address was delivered at Santa Scholastica when he received the St. Benedict Award, a very fitting read for the afternoon. The group then met up with Dom Maurizio again for a tour of the Convent of Santa Scholastica. The convent is a one of a kind mix of architecture, from Roman, to gothic, to byzantine.